The weather has been so fabulous these last few days I can’t go near my sewing room, but spend all my time in the garden. I also spend alot of time at my local garden center. I am fortunate to have the most fabulous little garden/gift store less than 10 minutes from my house. 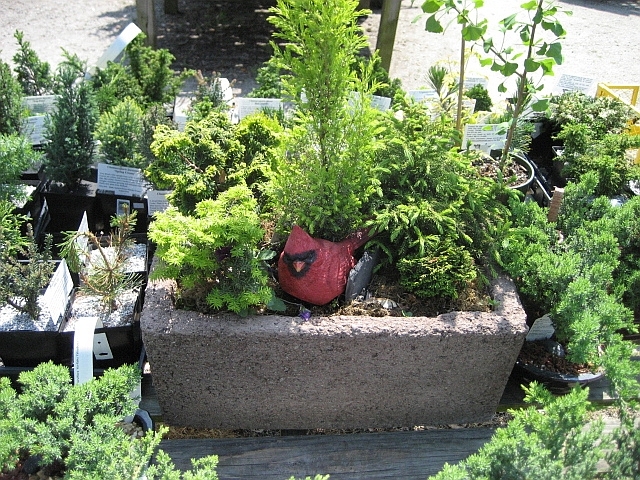 Countryside Gardens has the best selection of plants and garden ornaments/pots and garden stuff! Then inside the store it is stuffed full of the coolest and prettiest gift items. I always find something! Yesterday and today! when I stopped by they have a gorgeous trough garden. It is stuffed full of dwarf conifers and tucked in among those is a cute cardinal! 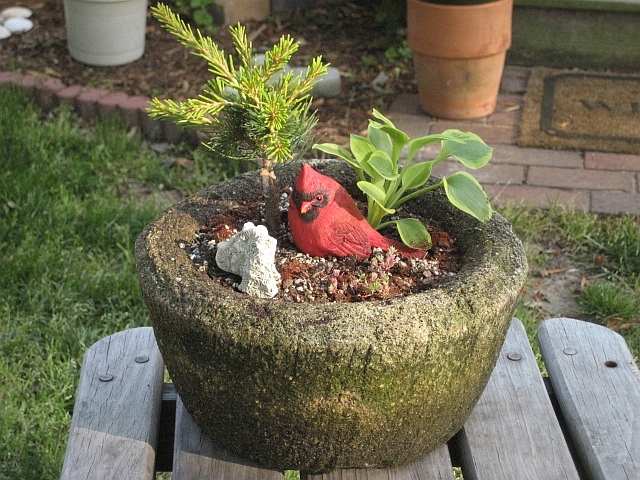 I had to steal this idea so I purchased a smaller cardinal, (my trough is smaller) and a new dwarf conifer and made my own version. My trough includes a miniature hosta and a tiny little sedum and some coral. Sweet! 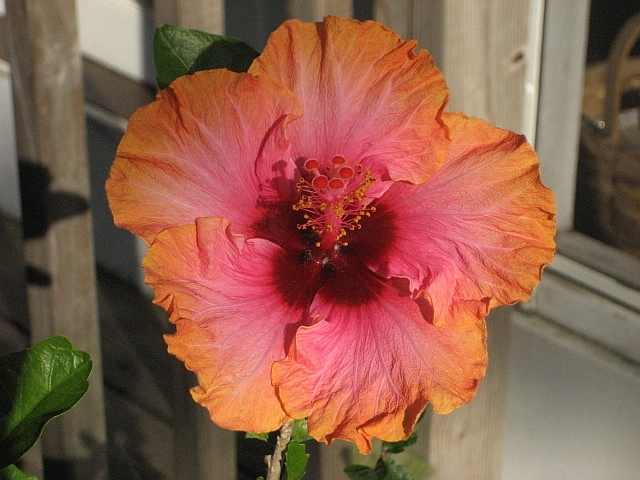 This beautiful hibiscus is blooming in my garden now too! Gorgeous! 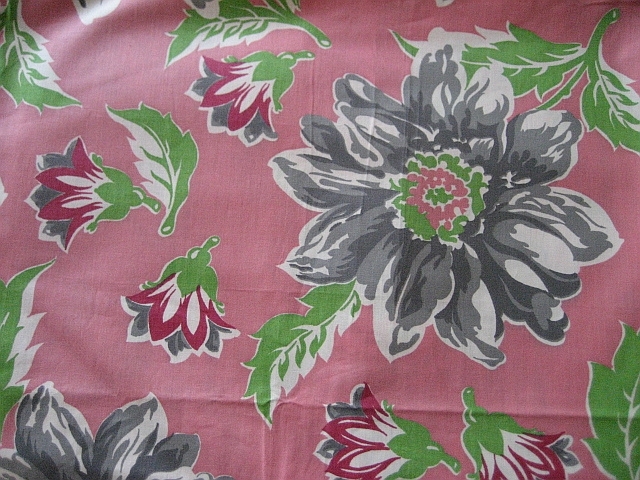 I have decided to end all my blog entries with a picture of a vintage fabric from my collection. Since I have hundreds I can take pictures for years to come and never run out! Enjoy! Love the garden container! The cardinal really “makes” it. And the color on that hibiscus is amazing. You know I’ll look forward to seeing your vintage fabric picture. Oh, in the garden or in the sewing room…what a tough choice. These are my two favorite places. I love the little trough, might try my own! Thanks for the inspiration.